මහාද්වීපයක් යනු පෘථිවිය මත ඇති විශාල එකට බැඳුණු භූමි ප්‍රදේශයකි. දැනට පිළිගැනෙන සම්මතයට අනුව ලෝකය මහාද්වීප 7කට බෙදෙන අතර ඒවා විශාලත්වය අඩු වෙන පිළිවෙලට ආසියාව, අප්‍රිකාව, උතුරු ඇමෙරිකාව, දකුණු ඇමෙරිකාව, ඇන්ටාර්ක්ටිකාව, යුරෝපය, සහ ඕස්ට්‍රේලියාව වෙයි. බොහෝ විට ඕස්ට්‍රේලියාව තනි මහාද්වීපයක් ලෙස සැළකුණ ද තවත් සමහරෙක් එය ඕෂනියාව නමැති තවත් මහාද්වීපයක කොටසක් ලෙස සළකති. ඔවුන් පවසන අන්දමට ඕෂනියාවට ඕස්ට්‍රේලියාව, නවසීලන්තය සහ පැසිපික් දූපත් අයත් වෙයි . උතුරු ඇමෙරිකාව සහ දකුණු ඇමෙරිකාව එකම මහාද්වීපයක් යැයි සමහරෙක් පවසති. තවත් සමහරෙකුගේ මතය අනුව යුරෝපය සහ ආසියාව යනු යුරේසියාව යන මහාද්වීපයේ කොටස් දෙකකි. යුරේෂියාව සහ අප්‍රිකාව යුරාෆ්‍රේසියාව නමැති විශාල මහාද්වීපයක කොටස් දෙකකැයි මතයක් ද පවතියි. The six-continent combined-America model is used in Spanish-speaking countries and in some parts of Europe including Greece (equivalent 5 inhabited continents model (i.e. excluding Antarctica) still also found in texts). 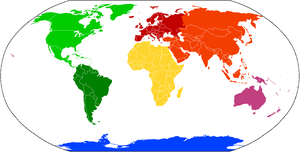 Using this latter model as a starting point, the International Olympic Committee uses only inhabited continents (excluding Antarctica) and thus a five-continent model as depicted in the Olympic logo. The terms Oceania or Australasia are sometimes substituted for Australia to denote a region encompassing the Australian continent and various islands of the Pacific Ocean that are not included in the seven-continent model. For example, the Atlas of Canada names Oceania, as does the model taught in Italy, Greece and in Latin America, Spain and Portugal. ↑ R. W. McColl, ed (2005, Golson Books Ltd.). 'continents' - Encyclopedia of World Geography, Volume 1. පි. 215. ISBN 9780816072293. http://books.google.com/books?id=DJgnebGbAB8C&pg=PA215&redir_esc=y#v=onepage&q&f=false. Retrieved 2012-06-26. "And since Africa and Asia are connected at the Suez Peninsula, Europe, Africa, and Asia are sometimes combined as Afro-Eurasia or Eurafrasia." ↑ 5.0 5.1 "Continent". The Columbia Encyclopedia. 2001. New York: Columbia University Press - Bartleby. ↑ 8.0 8.1 8.2  official Greek Paedagogical Institute 6th grade Geography textbook, 5+1 continents combined-America model, Pankosmios Enyklopaidikos Atlas, CIL Hellas Publications, ISBN 84-407-0470-4, page 30, 5+1 combined-America continents model, Neos Eikonographemenos Geographikos Atlas, Siola-Alexiou, 6 continents combined-America model, Lexico tes Hellenikes Glossas, Papyros Publications, ISBN 978-960-6715-47-1, lemma continent(epeiros), 5 continents model, Lexico Triantaphyllide online dictionary , Greek Language Center (Kentro Hellenikes Glossas), lemma continent(epeiros), 6 continents combined-America model, Lexico tes Neas Hellenikes Glossas, G.Babiniotes, Kentro Lexikologias(Legicology Center) LTD Publications , ISBN 960-86190-1-7, lemma continent(epeiros), 6 continents combined-America model.Note and clarification on the above: the sometimes used in Greece 5 and 5+1 continents models mentioned above are equivalent to the 6 (inhabited) continents combined-America model excluding/including (separately mentioning) the uninhabited and once lesser-known or unknown Antarctica (just like the Olympic Circles-Logo); they don't refer to some other 5 or other number continent modeling scheme. ↑ 9.0 9.1 "Continent". Encyclopædia Britannica. 2006. Chicago: Encyclopædia Britannica, Inc.
මේ පිටුව අන්තිමට සැකසුවේ 9 සැප්තැම්බර් 2014 දින දී, 02:07 වේලාවෙහිදීය.